Many pages of the papers are devoted to the crisis in North Korea. For the Daily Express, the firing of a missile over Japan has left the world teetering "on the brink" of war. With Theresa May beginning a three-day visit to Japan, the Daily Telegraph reveals that the prime minister will be told to follow the country's emergency "duck and cover" drill if another missile is unleashed by Pyongyang. "What should the West do?" asks the Daily Mail, turning to a crisis research specialist, Mark Almond, for the answer. 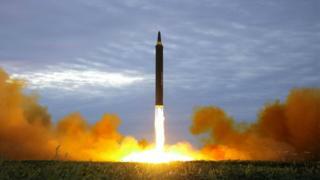 Diplomacy has a "poor track record in Pygongyang", he says, while sanctions are "slow to deliver". A limited strike could lead to all-out war and a full invasion would leave the US exposed elsewhere. The Daily Mirror's head of politics, Jason Beattie, believes there is "no good" solution. He argues that striking first against Pyongyang would leave South Korea at risk of retaliation, assassinating Kim Jong-un would not necessarily resolve the crisis, and diplomacy relies too much on China. Pictures of the devastation in Houston after Hurricane Harvey provide grim viewing. The Daily Mirror shows a toddler wandering alone in a flooded street while another - using a black rubbish bag as a waterproof cape - huddles in a shelter. The Guardian puts the bill for cleaning up after the storm at $100bn. Melania Trump's "disaster chic" makes the front pages of both the Daily Telegraph and the Times. Her outfit of aviator sunglasses, black tailored trousers and FLOTUS baseball cap - paired initially with four-inch designer heels - is put under the spotlight. The Times reports that, "after a social media backlash", the stilettos had made way for a more sensible pair of trainers, but the sunglasses stayed, despite the rain. The Daily Mail reports that GP referrals for non-urgent hospital appointments will have to be approved by a panel of doctors, as part of plans to cut costs in the NHS. It says health trusts across England are being told to conduct peer reviews from next week. The paper cites a leaked memo, which it says suggests the government is offering financial incentives to trusts to set up the scheme, with the aim of cutting referrals by 30%. The Times takes the credit for a judge's decision to remove a white British Christian girl from a Muslim foster family, saying that it had been praised for publicising the details of the placement. "Teachers shift blame for cheating" says the Daily Telegraph, as it reveals that the country's leading private schools are calling for exam boards to bring in stricter safeguards to counter the temptation for teachers who act as examiners to help their pupils. The chairman of the Headmasters' and Headmistresses' Conference insists that teachers risk being placed in an "impossible position" when setting tests in their own subjects. The Times suggests 100,000 Twitter users in Britain are unwittingly retweeting pro-Kremlin propaganda written by a suspected Russian "troll" posing as a UKIP supporter. It says the tweets have pushed Kremlin "talking points", such as casting doubt on Russian involvement in the downing of the MH17 passenger jet over eastern Ukraine. The holder of the account has denied any link to Moscow, and insists he lives in the south of England. Several papers show images of flowers being laid at Kensington Palace in memory of Princess Diana on the eve of the 20th anniversary of her death. The Daily Telegraph's columnist, Philip Johnston, makes a plea for the "sea of tears" for the princess to be held back. He recalls the "outpouring of national grief" at her death as something he found "distinctly perturbing and unsettling" and considers that Britain has become "a nation that mourns too readily".